You can find more info and past issues here. Even more Photomatix Pro presets! Free Photomatix Pro Presets Mega Pack! Art is not about "likes"
Do we really need HDR? Being an amateur means... worse? How to capture great HDR photo? What HDR can give you? Apart from brand new and professionally looking .com domain there are more changes. I switched to WordPress finally what means virtually no limits as far as layout & features are concerned. Blogger is a cool blogging platform because it requires virtually no webmaster / developer knowledge - everyone can use it to share their thoughts quickly. But with ease come limitations - it's very hard to make any significant changes to how the blog looks. I achieved different look but it required a lot of effort and as a developer myself I'm aware that changes I did shouldn't be as difficult to achieve. Blog on Blogger will remain accessible for the next couple of weeks (until all remaining content is moved) but all new posts will be published on http://hdr-photographer.com/ from now on (including my review of Lightroom 6 which was released just yesterday). After that period of time I will set up redirection. Also if you're following my blog, please make sure to subscribe to that new blog. For today I decided to share another image from Copenhagen. It shows The Round Tower (Rundetårn) which is the oldest functioning observatory in Europe - it was built in 17th century by Danish King Christian IV. The tower isn't very high, it's only about 40 meters tall but it still offers very nice view over Copenhagen old town. Unfortunately when I was at the top, the weather was far from perfect with a lot of clouds and flat light so I didn't get any decent shots. Maybe next time :) Interesting thing is that to get to the top you don't have to climb any stairs. No, instead there is a spiral path which was built because the king wanted to be able to get to the top by his horse-drawn coach. Quite convenient I must say. As you can see I felt a little artistic when processing this image. The light, textures and detail together with composition made me want to give this image a bit more "fine art" look - something that you can hardly ever find in my photos. I hope you like it. Interesting thing is that it is one of my most popular images I've ever uploaded to 500px. It scored 99.6 and almost 10.000 views. Not bad at all :) BTW if you're on 500px make sure to connect with me. I started to use 500px more often once again and upload lots of images there recently. Time for another image from Copenhagen as you seem to like photos from that city (I like them too by the way). This one was taken inside Amalienborg Palace, which is home of Danish royal family, and shows one of the many chambers there - Throne Hall. King was sitting on the left and queen on the right throne. Thrones are also protected by two lions (fortunately they are just sculptures). To get this photo I employed several different techniques: exposure fusion (to process ceiling, floor, walls, lion sculptures), tone-mapping (for thrones, windows and some other smaller areas), manual blending and luminosity masking to blend results of exposure fusion and tone-mapping and to finish the image. So it required quite a lot of work but I'm pretty pleased with the end result. I hope you like it too! which is held by Photomatix team (I just mention it here). What you need to do to enter the contest is to edit one of your images in any of Photomatix products (eg. Pro, Essentials or Photoshop Plugin) and submit them on the contest page before 21st June 2015 to one or two categories which are Realistic and Creative HDR. You may submit 3 entries per each category - 6 photos in total. BTW if you don't have Photomatix software, you can use trial version which can be downloaded from HDRsoft website. The fact there will be watermark present on your images won't affect jury decision in any way. There are other requirements for photos entering the contest, so make sure to read the rules before sending them. What you can win? In each category main prize is 500 USD Amazon Gift Card (good to buy some photo equipment ;) ) and Photomatix Pro Plus bundle license. If you're unlucky and come 2nd place you will win 200 USD Amazon Gift Card (still enough to buy some photo equipment :) ) and Photomatix Pro license. What are you waiting for? Edit your images and enter the contest! BTW, if you don't know how to use Photomatix, make sure to read my free HDR tutorial about it to get started. I hope that, it will help you a little bit. Today I would like to share another landscape photo from Thailand. The one below was taken on a beautiful and peaceful island of Koh Lipe in Satun province very close to Malaysian border. It was just before sunrise and amazing purple & magenta tones started to appear on the sky and water. I used 30 seconds exposure here to blur any ripples and waves and thus create very tranquil atmosphere. I have just returned from a short trip to Copenhagen where I spent this year Easter so today will be short break in photos flow from Thailand. I think that sharing photos from various locations might in fact make my blog much more interesting. I must admit that before my travel I was a bit sceptical about that city - I thought of it at as a rather boring place, with bad weather. But I was very positively surprised. It's a beautiful city with very unique atmosphere. Amazing architecture, very nice colours all over the place, it's very clean and it's very very lively (people are running, singing, kayaking, riding bicycles or simply sitting in the cafes and restaurants - there is so much going on wherever you look). It also seems I was very lucky as I read that on average it's raining in Copenhagen at least every 3 days (what gives 113 days of rain per year!) but during my stay weather was beautiful most of the time with short periods of cloudy sky. But not a single rain drop! Nyhavn is one of the most picturesque and colourful parts of Copenhagen that I managed to visit. Brightly coloured houses (some dating 17th century), reflections in the water, boats parked on both sides of the canal make it a really beautiful place. And a place where you want to spend some time. Nyhavn, what literally means New Harbour, was constructed in 17th century by King Christian V as a gateway from the sea to the old inner city. Interesting thing is that one of the most famous Danish writers, Hans Christian Andersen, lived there for 18 years. To create this image I took 5 exposures, 1 EV apart and used Photomatix Pro's Fusion/Natural to blend them. Thanks to using the fusion I got very natural result. If you would like to learn more about Fusion/Natural, make sure to read section of my HDR tutorial about it. Up to now I wasn't great fan of smartphone photography (in fact I avoided it as much as I could) as I was pretty sure the results would be of poor quality, blurry, with low dynamic range, noisy. And with my previous phone they definitely were. But this might change as I recently discovered that my Samsung S5 has quite a capable camera. Apart from using my mighty DSLR, in Thailand I took a looot of smartphone photos. A few of them left me really impressed by what those modern smartphones can do. Dynamic range is quite good, sharpness is very good and colours rendition is very natural. Even in low-light it worked quite well most of the time. There is quite a lot of noise but I still found the photos perfectly acceptable. The only thing I miss on Samsung S5 are manual exposure controls as the only setting I can change is ISO and exposure bias. I cannot set exposure time nor aperture to what I want. RAWs would be nice too but I can live without them (and they would eat phone's memory pretty quickly I guess). All that is really impressive. I recently read an article on PetaPixel which seems to explain why smartphone cameras are that good nowadays - it seems that 92% of phone users take photos with their smartphones and 36% find quality of camera to be key to decision of buying a phone! So many phone users actually think of their smartphones as cameras. For many it is probably the only camera they have. I will start to think that way too probably because I don't carry my DSLR camera with me all the time, but I do carry my phone so it's good to know I have powerful camera in my pocket whenever I need it. Here's a little example. Below panorama was shot and stacked on my smartphone. It isn't perfect but still looks quite nice. And it was created pretty much automatically. In Lightroom I just increased vibrance and contrast a little bit as I found the results a little bit too flat for my liking. When I had been initially planning my Thailand trip a few months ago I intended to spent whole 2 weeks in one place - on Railay peninsula in Krabi province - which is photographer's paradise. But then I read that this place is becoming really boring after more than 2 - 3 days, that there is nothing you can do while being there. And I trusted those opinions and altered my plan (not that I regret as I visited another fantastic place). Lesson learnt: don't believe in opinions of non-photographers. Generally speaking this place is amazing and even after 8 days there I could find something new to do. I did a lot of swimming, some kayaking, I went on a few trips to nearby islands and spent some time trying local cuisine. If I would had stayed longer I would probably give rock climbing a try (BTW if you're climbing there are a few nice vantage points on Railay peninsula from which you could take some amazing photos). And yeah, this place is just amazing for landscape photography as you could already see from some of my other posts like this or this. Sunsets look really beautiful when you have such amazing cliffs in a foreground (or background depending how you compose your shots). As I mentioned in some other posts recently, Railay beach in southern Thailand was once selected as one of the 3 most beautiful beaches of the world by National Geographic magazine. 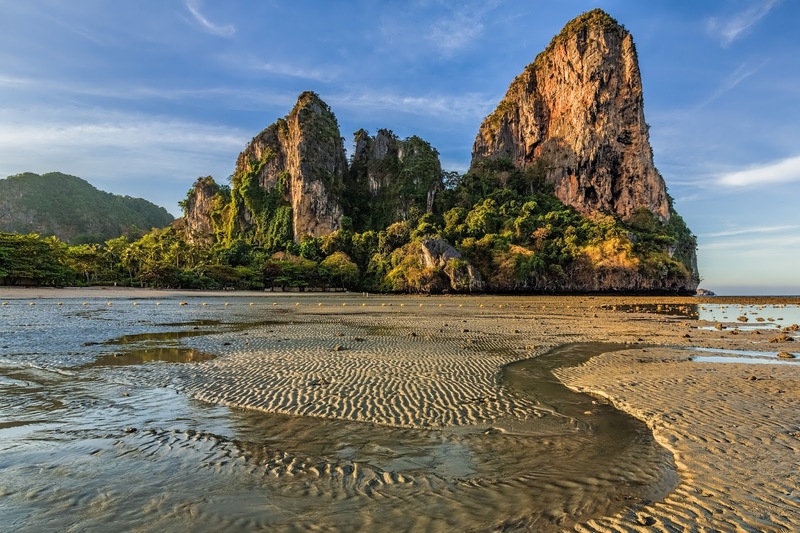 Although I wouldn't question that choice as Railay beach is indeed really impressive there is one thing funny about that - just 10 to 15 minutes away by foot there is even more impressive beach known as Phra Nang beach (sometimes referred to as Phra Nang cave). Phra Nang, similarly to Railay, is closed by high limestone cliffs on both sides. But apart from that you can find several caves and caverns there, you have excellent view on the nearby deserted islands and generally whole experience feels more unreal (really! swimming or kayaking in such place is life lasting memory and I cannot believe I was there). It makes it a great place not only to relax but also to take some landscape photos. And due to location of that beach, it is a perfect place to take some sunset images. Despite the fact, the place is sometimes crowded during midday, near sunset it becomes pretty much deserted with just a few people walking on the beach and trying to capture sunset with their smartphones. And accidentally standing just in front of the lens thus ruining long exposure images :) but I can't blame them of course as they do the same as I do - try to capture beautiful moment. Anyway, to take the image below I entered one of the caverns on Phra Nang beach during low tide. During high tide it's impossible to take such photo as cavern is full of water and there is no safe place to put a tripod there. Below photo is a HDR image. I took 7 exposures at 1.5 EV spacing. As you can see even that many exposures aren't enough to recover all details in shadows. However, in case of this image it was done on purpose because I wanted to have top part of the image underexposed to attract attention to spectacular colours in the sky and water.